Fine wine is becoming more popular, as is buying wine by the glass. But whilst selling fine wine by the glass can be profitable, it’s also dangerous – once the bottle is opened the wine can spoil, deteriorating rapidly over a few days. Wasting expensive wine means profits will tumble. The new WineEmotion system uses patented technologies to serve and preserve fine wines, after the bottle is opened. It also offers a stylish and attractive point-of-sale display that will encourage and inform discerning customers. Designed and manufactured in Italy, the new system is distributed in Great Britain through WineEmotion UK. 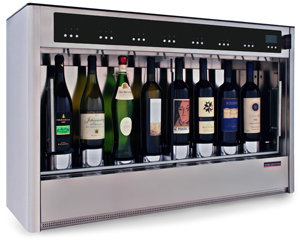 Depending on the model, up to eight bottles of wine can be stored inside the WineEmotion dispenser. Each bottle is connected to an individual dispensing system, which uses argon or nitrogen gas to preserve the wine’s properties during storage. These gases are inert and entirely food-safe. They prevent oxidisation, so the wine remains as fresh as when it was uncorked, for up to 30 days. 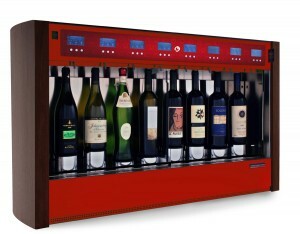 The dispensing system gives absolutely accurate measures of the wine, eliminating staff error and protecting profits. Up to three different sizes of measure can be dispensed, at the push of a button. A range of software packages means the site can monitor both the system’s performance and data on the fine wine service. Patented technologies are designed to protect the individual wines to the nth degree. For example, WineEmotion’s ISOL Plus feature stores individual wines in total isolation – to the extent that each bottle has its own, isolated supply of the inert gas that prevents oxidisation. This eradicates the possibility of cross contamination that could spoil the aroma of the wine. The WineEmotion range offers a wide choice of models, storing from five to eight bottles at a time. For example, the Quattro+4 stores up to eight bottles at once. A highly accurate temperature control system ensures that the wine is kept and served in the best possible condition. It has two climate zones, so that both white and red wines can be stored in, and served from, the same unit. The Quattro+4 is available in stainless steel as the base model with a choice of optional colours and finishes so it can be tailored to the site’s decor and style. Prices for the WineEmotion range start from £3,750. The Quattro+4 starts from £7,650 for the eight bottle dual temperature unit. The range is available direct from WineEmotion UK. For more information visit www.wineemotionuk.com or call +44 (0)1635 282230.